ATLANTA – Today the Rheumatology Research Foundation announced the overwhelming success of its largest fundraising campaign, Journey to Cure. The campaign surpassed its goal of raising $60 million with a grand total of $61,430,466. Dollars earned fund awards for more than 900 rheumatology professionals to conduct research and pursue training. Journey to Cure was implemented in 2012 to support the Foundation’s mission to improve the health of people with rheumatic diseases. Dollars raised during the campaign are directly invested into the Foundation’s mission objectives to recruit and train future rheumatologists and health professionals, foster innovative research ideas in rheumatology and accelerate advancements in treatments and cures for all rheumatic diseases. Among the awards supported by Journey to Cure were 197 education and training awards that build the rheumatology workforce and help decrease patient wait times, 102 career development awards that encourage investigators to study rheumatic diseases, 523 student awards that recruit and train future rheumatology professionals, and 87 Innovative Research Awards for investigators studying the underlying causes and potential treatments of rheumatic diseases. Alexis Ogdie, MD, MSCE, is one of several rheumatology professionals who received Foundation funding during Journey to Cure. “The ultimate goal of rheumatology research is really to support patients and to improve the treatment and options for patients and to improve long-term outcomes. Supporting rheumatologists through their career in order to launch their research career and really sustain it is incredibly important for those things to be accomplished,” Dr. Ogdie said. 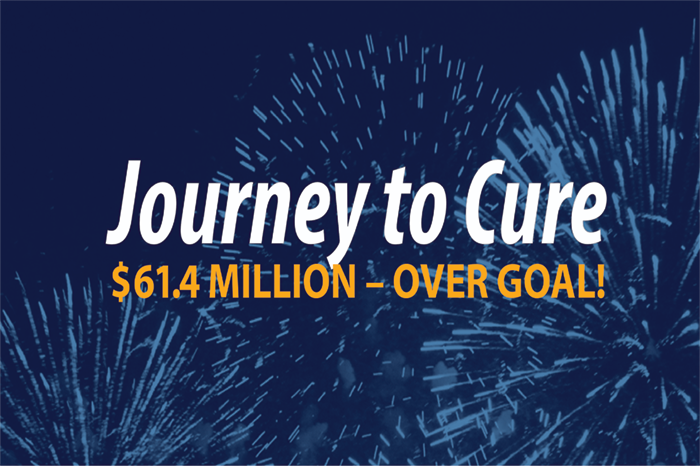 In addition to training rheumatology professionals and funding research for investigators, Journey to Cure inspired unprecedented leadership commitments which enabled the Foundation to expand its award offerings to better fill needs within rheumatology. The Tobé and Stephen E. Malawista, MD, Endowment in Academic Rheumatology provides a permanent source of support for early career investigators to conduct basic science research and develop their careers. Likewise, the Norman B. Gaylis, MD, Research Award for Rheumatologists in Community Practice was established to encourage research from physicians who are engaged in patient care. The success of Journey to Cure would not have been possible without the support from its 3,869 donors. Supporters included the American College of Rheumatology and individuals within the rheumatology and patient communities. The Foundation’s Corporate Roundtable also played a fundamental role. Pharmaceutical industry leaders who joined the dynamic partnership are listed in alphabetical order as follows: AbbVie, Amgen, AstraZeneca, Bristol-Myers Squibb, Celgene Corporation, Genentech, Janssen Biotech, Eli Lilly and Company, Novartis Pharmaceuticals, Pfizer Inc., Regeneron, Sanofi Genzyme and UCB. “At AbbVie, we are committed to fostering innovation in rheumatology and advancing research for rheumatic diseases,” said Jim Salanty, vice president, U.S. Rheumatology, AbbVie. “It has been an honor to support the Journey to Cure campaign over the past several years, and to partner with the Rheumatology Research Foundation in their mission to improve treatment options and advance care for patients living with these potentially debilitating diseases.” Amgen, Inc., has also been an integral supporter of the Foundation’s awards and grants program. For those affected by rheumatic diseases, Journey to Cure offers hope for better health and a brighter future. Steve and Debbie Russell, whose daughter Courtney suffered with symptoms for nine months before she was diagnosed with systemic juvenile idiopathic arthritis, explain their support of the Foundation. “My appreciation and admiration for the Foundation has done nothing but skyrocket, and I give my eternal thanks to the doctors, researchers, and investigators who truly dedicate their lives to making a difference for the people who suffer from these diseases,” Steve Russell said.